The smaller of the two gasteruptiid subfamilies, Hyptiogastrinae has a restricted Gondwanan distribution, being found on the Australian mainland, Tasmania, New Zealand and South America, as well as New Caledonia, New Guinea, Fiji and Vanuatu (Jennings and Austin 1994a,b, 1997a, 2002). Jennings and Austin (2002) recently reduced the number of genera from five to two on phylogenetic grounds (Hyptiogaster and Pseudofoenus s.l. ), and more than doubled the number of described species to 88; most of these species are found in Australia. Hyptiogaster is endemic to mainland Australia and does not occur in Tasmania. The genus appears to be restricted to eastern and western subtropical, temperate, Mediterranean and semi-arid areas, and is absent from the tropical north and arid interior parts of the continent. The other genus in this subfamily, Pseudofoenus, is most diverse in south-western Western Australia (Jennings and Austin 1997a). The distribution of hyptiogastrines is indicative of one that has largely been determined by vicariance events associated with the breakup of the Gondwanan supercontinent, and hence would provide a date for the early radiation of the group of about 65 mya. Preliminary phylogenetic analysis of the subfamily by Jennings and Austin (2002), however, suggest that their current continental distribution may have been determined by dispersal events. When the Australian hyptiogastrine fauna is examined in more detail (Fig. 1), most species are seen to be restricted to a single region, with only 15 species (19%) being found in more than two regions. The highest species richness occurs in the Western Bassian Region (24 endemic spp. 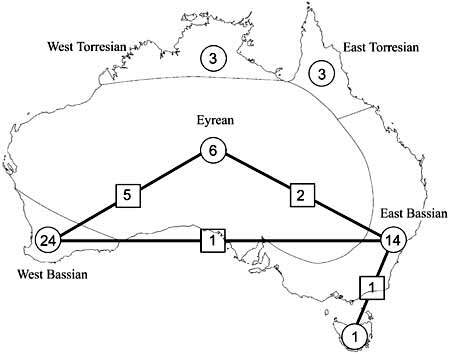 ), followed by the Eastern Bassian (16 spp., including Tasmania) and the Eyrean (6 spp.). When undescribed species are taken into account (of which there are about 30 species) the proportion of endemic taxa for the Western Bassian increases even further, as approximately half these undescribed species are known only from this area. Interestingly, very few species are restricted to the Torresian Region and none of these are shared with New Guinea. Figs. 2-3 (2) hyptiogastrine mouthparts, with crossed mandibles (M) and long galeae (G), scale=500 um; (3) hyptiogastrinae hind trochanter, without prefemur, scale=100 um. Fig. 4 Pseudofoenus thoracicus (Guérin-Menéville) forewing, first discal cell highlighted in pink. Fig. 5 Pseudofoenus crassipes (Smith) forewing, absence of first discal cell highlighted in pink. Figs. 6-7 (6) subgenital plate of Pseudofoenus darwini (Westwood), scale=100 um; (7) ovipositor sheaths of Pseudofoenus houstoni (Jennings & Austin), circled in blue, scale=100 um. Jennings and Austin (2002) recently published a phylogeny of Hyptiogastrinae and provided a key to spp. While there is only limited information on the host relationships of Hyptiogastrinae, it seems likely that they are predator-inquilines of solitary bees. There are museum records of Pseudofoenus asymmetricus (Turner) "at the nests" of the halictid bee Nomia australica Smith on Kangaroo Island, South Australia. Adults of P. houstoni (Jennings and Austin) have been observed hovering over and entering the burrows of Ctenocolletes (Stenotritidae) bees (Houston 1984b). There is also one record of P. macronyx leaving the nest of Stenotritus sp. (Stenotritidae) near Maree, South Australia. Pseudofoenus have also been captured entering the burrow of the colletid Euryglossula chalcosoma (Cockerell) in Queensland (Houston 1969), and "hundreds" of P. inaequalis (Turner) have been observed congregating around the nest shafts of the colletid Cladocerapsis persooniae Rayment (Parrott 1955). 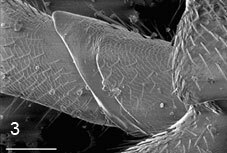 Records for Pseudofoenus in New Zealand suggest they are parasitoids of colletid bees. Pseudofoenus pedunculatus (Schletterer) has been recorded as a predator-inquiline of Leioproctus metallicus (Smith) (Gourlay 1930; Valentine and Walker 1991), and P. crassipes (Smith) and P. unguicularis (Smith) are associated with Paracolletes spp. (Jennings and Austin 1994b). It appears that Hyptiogaster are parasitic in the nests of Masarinae (Vespidae) and Stenotritidae. This genus has been observed hovering over the nesting area of the masarine Paragia tricolor Smith in Western Australia (Houston 1984a). Although none of the wasps were seen to enter the vespid's tunnels, their larvae were found in three cells. Hyptiogaster has also been observed entering nests of Paragia decipiens Shuckard (Naumann and Cardale 1987), and entering and leaving the nest shafts of Stenotritus pubescens (Smith) (Stenotritidae) (Houston 1975). 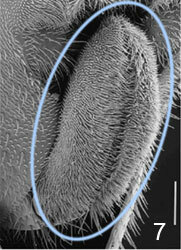 Ctenocolletes ordensis Michener (Stenotritidae) has been recorded as a host for Hyptiogaster (Houston 1984b). Hyptiogastrine wasps employ a hovering flight similar to that of Gasteruption when searching for and inspecting host nests. This has been observed for both Pseudofoenus (Houston 1969; Houston 1984a; Naumann 1983; Jennings unpublished), and Hyptiogaster (Houston 1984a). Pseudofoenus adults have been observed in South Australia circling nests of the colletid Xanthesma furcifera (Cockerell) and entering the nest shafts by wriggling their bodies as they pushed, abdomen first, into the sand (Houston 1969). They have also been observed engaging in a "bouncing, hovering" flight near the nesting sites of Hylaeus (Colletidae) in the Northern Territory (Naumann 1983). This behaviour has also been observed for several other species that occur near Adelaide, South Australia (Jennings and Stevens unpublished). Because the hosts of hyptiogastrine wasps are mostly ground nesting, often many centimeters below the surface, the female wasps must enter the nest tunnel to oviposit. However, oviposition has not been observed for any hyptiogastrine species. Like Gasteruptiinae, Hyptiogastrinae have an elongate labio-maxillary complex ideal for nectar feeding (Fig. 2). The galeae are flattened and foliaceous with a distinct galeal pecten, as in Gasteruption. The function of the galeal pecten, which is perhaps most developed in Pseudofoenus is at present not clear. The fused glossae are well developed in all hyptiogastrine wasps and are often 'sieve-like' (Fig. 2). This presumably increases their surface area and thus assists in the uptake of nectar. 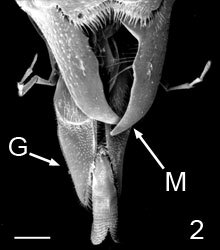 The labio-maxillary complex is articulated (Crosskey 1951), although in museum specimens, the glossae are often retracted behind the mandibles. Records of plant visitations/associations for Hyptiogastrinae are more widespread than for other biological information (Jennings and Austin 2004). There is no apparent pattern to the range of plants visited, although they visit similar plants to Gasteruption in the Australian region. The plants recorded mostly produce both pollen and nectar, although Hyptiogaster and Pseudofoenus have been recorded from Acacia spp. that do not have floral nectaries, although some species have extra-floral nectaries, often located at the base of the phyllodes. Most museum specimens of hyptiogastrines inspected have pollen in and around the mouthparts, ranging from just one or two grains to very heavy pollen loads, often more than 50 grains per specimen. These observations suggest that hyptiogastrine wasps may feed on both nectar and pollen. Alternatively, it is also possible that pollen may simply have been picked up during the process of feeding on nectar, and the results reflect more the type of flower visited rather than direct feeding on pollen. Nectar feeding has been observed for one species of Pseudofoenus, where the elongate glossae are used to probe the nectaries of Calytrix tetragona (Myrtaceae). An analysis of collecting data for various Pseudofoenus species indicates that adults of most species tend to be collected from spring through to autumn. A similar pattern is evident for Hyptiogaster species. Their bee hosts are active in these periods (Houston pers. comm. ), and it also reflects the flowering period of many of the plants visited by adult wasps. However, the collecting period for the two South American species, P. deletangi (Schletterer) and P. infumatus (Schletterer), is more restricted, the former being collected in October and November and the latter from November to February. For some Pseudofoenus species, the range of collecting dates is more variable. P. floricolus (Turner), which is very widespread in its distribution in Australia, has been collected from September to May (Fig. 12), whereas P. feckneri (Jennings & Austin) has only been collected from August to October. Pseudofoenus extraneus (Turner), which is endemic to Fiji, is not collected in the drier months of November to January. Data for P. unguiculatus (Westwood) indicate a shorter collecting period in the South Island of New Zealand than is found in the North Island, possibly reflecting the colder conditions encountered on the South Island. Thus, collecting data for the Hyptiogastrinae suggests that they are for the most part univoltine. Whether or not this is the case for all species is less obvious given the wide range of collecting dates and the lack of field observations. Crosskey, R. W. 1951. The morphology, taxonomy, and biology of the British Evanioidea (Hymenoptera). Transactions of the Royal Entomological Society of London 102: 247-281. Gourlay, E. S. 1930. Preliminary host-list of the entomophagous insects of New Zealand. Bulletin of the New Zealand Department of Scientific and Industrial Research 22, 1-13. Houston, T. F. 1969. Observations on the nests and behaviour of some euryglossine bees (Hymenoptera: Colletidae). Journal of the Australian Entomological Society 8, 1-10. Houston, T. F. 1975. Nests, behaviour and larvae of the bee Stenotritus pubescens Smith) and behaviour of some related species (Hymenoptera: Apoidea: Stenotritinae). Journal of the Australian Entomological Society 14, 145-154. Houston, T. F. 1984a. Bionomics of a pollen-collecting wasp, Paragia tricolor (Hymenoptera: Vespidae: Masarinae), in Western Australia. Records of the Western Australian Museum 11, 141-151. Houston, T. F. 1984b. Biological observations of bees in the genus Ctenocolletes (Hymenoptera: Stenotritidae). Records of the Western Australian Museum 11, 153-172. Houston, T. F. 1987. A second contribution to the biology of Ctenocolletes bees (Hymenoptera: Apoidea: Stenotritidae). Records of the Western Australian Museum 13, 189-201. Jennings, J. T. and Austin, A. D. 1994a. Revision of the genus Crassifoenus Crosskey (Hymenoptera: Gasteruptiidae: Hyptiogastrinae), with a description of a new species from Western Australia. Records of the Western Australian Museum 16, 575-91. Jennings, J. T. and Austin, A. D. 1994b. 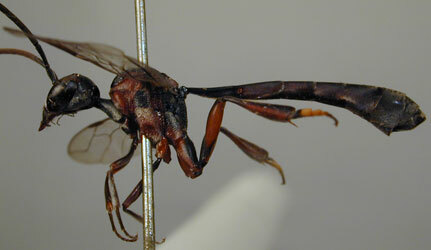 Revision of Pseudofoenus Kieffer (Hymenoptera: Gasteruptiidae), a hyptiogastrine wasp genus endemic to New Zealand. Invertebrate Taxonomy 8, 1289-1303. Jennings, J. T. and Austin, A. D. 1997a. Revision of the Australian endemic genus Hyptiogaster Kieffer (Hymenoptera: Gasteruptiidae), with descriptions of seven new species. Journal of Natural History 31, 1533-1562. Jennings, J. T. and Austin, A. D. 1997b. Revision of Aulacofoenus Kieffer (Hymenoptera: Gasteruptiidae), hyptiogastrine wasps with a restricted Gondwanic distribution. Invertebrate Taxonomy 11, 943-976. Jennings, J. T. and Austin, A. D. 2000. Higher-level phylogeny of the Aulacidae and Gasteruptiidae (Hymenoptera: Evanioidea). pp. 154-164. In Austin, A. D. & M. Dowton (Eds) The Hymenoptera: Evolution, Biodiversity and Biological Control. CSIRO Publishing, Melbourne. Jennings, J. T. and Austin, A. D., 2002, Systematics and distribution of world hyptiogastrine wasps (Hymenoptera: Gasteruptiidae) Invertebrate Systematics 16, 735-811. Jennings, J. T. and Austin, A. D., 2004, Biology and host relationships of aulacid and gasteruptiid wasps (Hymenoptera: Evanioidea): a review. pp. 187-215. In Rajmohana, K., Sudheer, K., Girish Kumar, P., & Santhosh, S. (Eds.) Perspectives on Biosystematics and Biodiversity. University of Calicut, Kerala, India. Kieffer, J. J. 1912. Evaniidae. Das Tierreich 30, 1-431. Naumann, I. D. 1983. The biology of mud nesting Hymenoptera (and their associates) and Isoptera in rock shelters of the Kakadu Region, Northern Territory. Australian National Parks and Wildlife Service Special Publication 10, 127-189. Naumann, I. D. and Cardale, J. 1987. Notes on the behaviour and nests of an Australian masarid wasp Paragia (Paragia) decipiens decipiens Shuckard (Hymenoptera: Vespoidea: Masaridae). Australian Entomological Magazine 13, 59-65. Parrott, A. W. 1955. 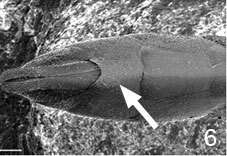 A note on the distribution and host of Hyptiogaster inaequalis Turner, an Australian gasteruptionid (Evanioidea). Proceedings of the Royal Zoological Society of New South Wales 1953-1954, 68-69. Valentine, E. W. and Walker, A. K. 1991. Annotated catalogue of New Zealand Hymenoptera. DSIR Plant Protection Report No. 4. Page: Tree of Life Hyptiogastrinae. Authored by John T. Jennings and Andrew R. Deans. The TEXT of this page is licensed under the Creative Commons Attribution-NonCommercial-ShareAlike License - Version 3.0. Note that images and other media featured on this page are each governed by their own license, and they may or may not be available for reuse. Click on an image or a media link to access the media data window, which provides the relevant licensing information. For the general terms and conditions of ToL material reuse and redistribution, please see the Tree of Life Copyright Policies.